"Our goal is to be treating colorblindness in clinical trials in patients in the next one to two years," said Dr. Thomas Chalberg, the founder and CEO of Avalanche. The company will be entering IND-enabling studies this year. The agreement has its roots in a scientific breakthrough that occurred six years ago. That's when two vision researchers at the University of Washington used gene therapy to cure a common form of colorblindness in squirrel monkeys. "This opened the possibility of ultimately getting this to cure colorblindness in humans," says Jay Neitz, who runs the Color Vision Lab at UW along with his wife, Maureen Neitz. The company also announced, that outside of the scope of the license agreement, Drs. Jay and Maureen Neitz, faculty in the UW's Department of Ophthalmology and color vision deficiency (CVD) experts, have joined its Scientific Advisory Board. They will be technical advisors to the company on the science of vision. "This agreement with the University of Washington and world-renowned vision scientists Drs. Jay and Maureen Neitz will help us further advance our goal of developing therapeutic products for the millions of people who suffer from CVD," said Dr. Chalberg. "Our proprietary technology enables us to target the retina through intravitreal adeno-associated virus delivery, presenting, for the first time, the opportunity to pursue previously untreatable ophthalmic conditions such as CVD." Avalanche will build on gene therapy research conducted by the Neitz research team, who used gene therapy to confer color vision in two adult male squirrel monkeys that had been color blind since birth. This groundbreaking work demonstrating proof-of-concept for treating CVD was published in the journal Nature (1). Curing color blindness involves delivering new genes to cells in the retina that respond to color. That's how Jay and Maureen Neitz cured the squirrel monkeys six years ago. But the technique they used involved a surgical procedure on the retina. For people, they desired a nonsurgical approach, something that had eluded researchers for years. Then a team at the University of California, Berkeley found a way to deliver genes using a simple injection into the vitreous, the clear gel that fills most of the eyeball. Avalanche Biotechnologies has been working to improve and commercialize the Berkeley technique, said Chalberg. So, Avalanche will combine the CVD gene therapy approach discovered by Drs. Jay and Maureen Neitz, with the licensed technology from the University of California at Berkeley and improved by Avalanche which will allow treatment via an intravitreal injection, similar to how wet AMD treatments are currently delivered in ophthalmologist’s offices, in a simple in-office procedure. 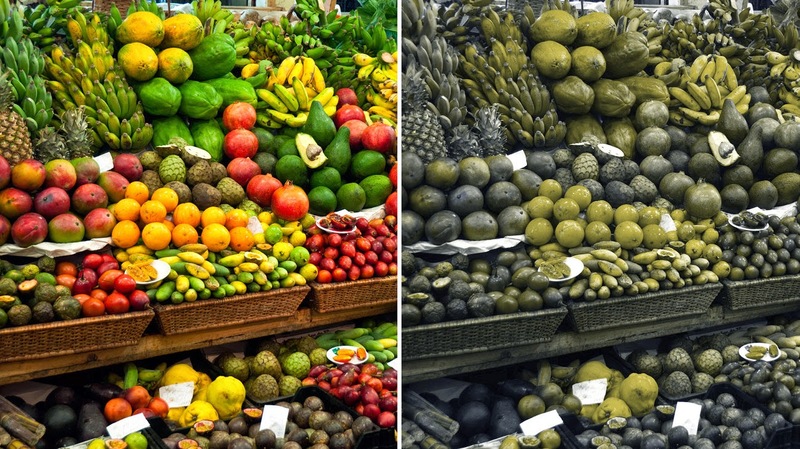 Color vision deficiency (CVD), also known as red-green color blindness, is among the most common genetic diseases. CVD affects approximately 8 percent of males and 0.5 percent of females, or more than 10 million people in the U.S alone. CVD is a visual impairment that impacts many aspects of everyday life, resulting in limitations in professional choices, compromised health and safety, and the inability to perform many activities of daily living. A simulation from the Neitz lab of what color blindness looks like, with normal color vision on the left and red-green color blindness on the right. Photopigments in the retina are crucial for perceiving color. People with normal color perception have three different types of photopigments. These photopigments are tuned to perceive either long wavelengths (red), middle wavelengths (green) or short wavelengths (blue), respectively. The most common forms of CVD are due to genetic defects that lead to missing either the L-opsin (Type 1, or protan defects) or the M-opsin (Type 2, or deutan defects). Affected individuals have trouble distinguishing between red and green and between colors that contain red or green hues. 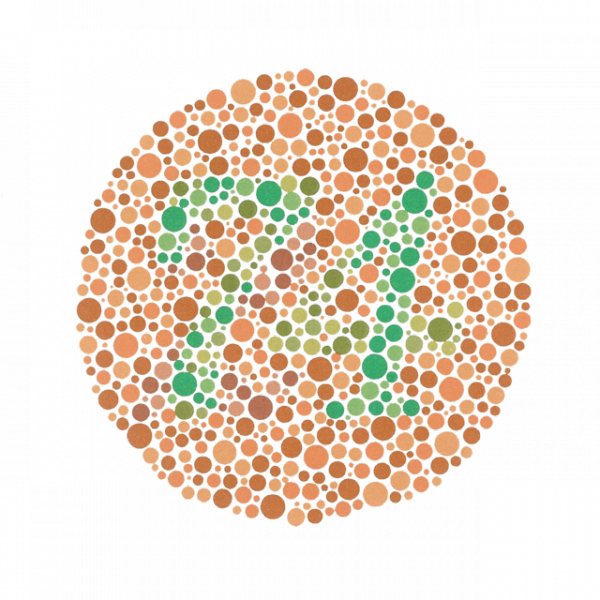 Ishihara plate, a typical test for red-green colorblindness. Avalanche has two drug candidates targeting these areas. AVA-322 carries the gene for L-opsin and is being developed for the treatment of Type 1 color vision deficiency. AVA-323 carries the gene for M-opsin and is being developed for the treatment of Type 2 color deficiency. Avalanche expects to file an IND in the second half of 2016 to support advancement of these drug candidates into clinical trials, using Avalanche’s breakthrough non-surgical intravitreal injection method to deliver genes directly to cone cells at the back of the eye. The company recently launched www.colorvisionawareness.com for patients with color blindness to receive information about the condition and potential research study opportunities. An Update on Avalanche Biotechnologies: A Potential Longer-Lasting Wet AMD Treatment? May 2014. 1. Gene therapy for red-green colour blindness in adult primates, Mancuso, K. et al, Nature, 2009; 461:784-787.